Within your Contact Manager, you have individual contacts and team contacts. As it sounds, individual contacts are private to you, and team contacts are shared amongst your team. When you connect an individual inbox with Front, your individual contacts are kept separate from your team. Create and edit your private contacts under Individual Contacts in Front’s Contact Manager — and when someone emails you, new contacts are added there automatically. 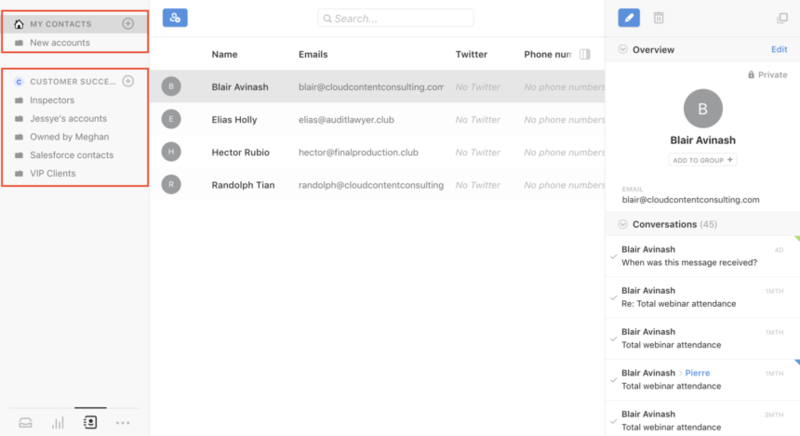 If you’re using Teams to manage multiple workspaces in Front, contacts are handled separately. Choose the Team you’re looking for in the side panel of the Contact Manager to view, edit, or create contacts and contact groups for that specific Team. If you only have one Team, you will only see one Team in the first pane. There's no way to migrate contacts from one Team to another Team. For those previously using Front before individual contacts and team contacts were established, all of your contact groups will be migrated to your first Team. Is there a way to add an Individual Contact to a Team's contact list or share Contact Groups? We use both individual and team contacts all the team. Do we have to do double entry on them all? Leslie Currently, the only way to make a private contact shared is to recreate it. We are working on improving this, but it's definitely a very manually process right now. Cori Morris - Thanks for letting us know. And yes, a way to share would be good. This is going to mean that we'll have 1000s of contacts that must be duplicated. Is there a 3rd party solution/plugin that would allow us to share? It is not a minor thing for us. Leslie Not at this time, but I'll definitely let you know when we build this functionality. This is easily the worst thing about Front for us. We are having recreate hundreds and hundreds of contacts. It is one big mess and it is only going to get worse. How big of a priority is this on the Front roadmap? For example, we have two teams, plus 3 individuals that need to work with the same 300+ contacts. In order to share just the basic contact data this means we'll have to have 1500 contacts in Front instead of just 300. Am I understanding this correctly? That is 1200 unnecessary contacts since it is just the same 300 contacts across all the above. Using a CRM will help some, but not a ton because we have to manage support tickets across these teams and individuals as well. This screws up search, filters, etc... or at least it is appearing to. What is the recommended solution here? Like I said 3 months ago, this is going to grow into the 1000s. Why is there no "master contact list" shared across all of Front that we can opt into? Our product manager is going to reach out to you directly. We appreciate this feedback and for bringing it to our attention! We have been very happy with the functionality of FRONT, however I would certainly like to have better management of the contacts. This includes being able to NOT have contacts that come from our web chats automatically saving to our contact. Also, if you want to delete contacts, you have to do one at a time, there should be a way to mark and delete all at once. 1) Automatically saving contacts - this is a preference that the company admin can turn on/off for the company, within Settings > Contacts. 2) Bulk delete contacts - you can select multiple contacts by holding down the COMAND or SHIFT key and clicking, then delete all the selections at once. Any chance that contacts are going to get some love now that the new front is being released? While we would love to be able to use Front as a better CRM, ideally just some basic improvements would go a long way. Helena Li Thanks! I think Leslie touched on most of this - it's the sharing and duplication issues that we're struggling with.